Hi has anyone out there used a UK company to test an ECU off a YB4 or similar. It is a Weber Marelli IAW 041 unit with the marking WB41.07/004.08. I have heard all sorts of stories about 851/888 using them and various late 80's early 90's Italian sports cars but none seem quite the same. The old girl stopped running at the side of the road last year and I can't get a spark anymore, the wiring loom has been rebuilt and the crank sensor changed but still no luck. I replied to your PM but didn't realise you'd tried Bluesteak. They were the company that looked at mine for me. 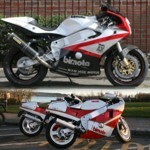 edit - I had all my fairings off mine at the weekend and gave the bike a good going over. I could of got some pictures, etc if required. It's all ready to go for an MOT now. You could install an Ignitech if it's just an ignition ECU, or does the same ECU do the fuel injection as well? I saw Andrew Stroud's WSBK YB4 at the recent International Festival of Speed. That bike had a programmable ECU under the seat into which you plugged various cards. Imagine trying to get a replacement for that!